When we started out the build, we were concerned with what to use as fastenings. Our plans stated that we basically needed some nails and screws which did not rust. After talking to some boatbuilding friends we decided to skip the nails. Copper nails in any variety of size are hard to come by in this country. We could have gotten some from Sweden via the Internet. 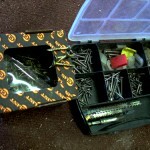 Further – the nails will only be there to help keep parts together while the epoxy is setting. The solid joint will benefit very little from the nail, the epoxy-wood combination will carry the majority of the stress. Thus we decided that if needed, we shall apply screws to whatever place necessary, since a screw holds better than a nail in almost any setting. Additionally banging a nail into a flexible surface is difficult because of resonance. On the other hand, shipbuilders have used nails for over thousands of years with great success. 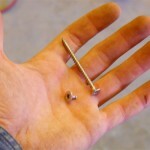 Yet technology has advanced, producing screws has become simpler and that is why we decided to go with screws. A cordless drill applies screws with joy. First we bought a load of stainless-acid-resistant hex-headed countersinking screws. Very expensive. During the initial stages of the build it turned out that these were the weakest screws either of us had ever come across. The heads popped off like done apples off a tree. This cost us valuable money and time and nerves and thus we decided to look into the matter again. We went for “nanocoated” hex headed countersinking screws. These are very strong, do not rust if the nanocoat is left on. Unfortunately they are as expensive as their stainless counterparts. The strength compensates the investment. We are not afraid of rust initially, since no screw head will be left to the elements, all shall be covered with glass, a clearcoat and paint. I am excited to have found a website that shows progress of building Fafnir. I too have bought the plans and will build the boat. Your sharing of your work, progress, ideas, and concerns help an amateur like me. Thank you, Bert. Glad to hear that other people are finding the build inspirational! We wish you persistence and a steady hand in your build. If you have any pictures as it comes along, we’d love to see them.